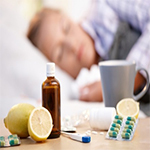 (HealthDay News) -- Flu and the common cold share some common symptoms. Though both often can be treated at home, more serious cases require a doctor's care. A persistent fever of higher than 102 degrees Fahrenheit that causes body aches and fatigue. Symptoms that persist for longer than 10 days, or symptoms that worsen instead of improve. Shortness of breath, difficulty breathing, or pressure or pain in the chest. Significant sinus pain affecting the forehead or face. Swelling of glands in the neck or jaw.